History of the North County Group | North County Group – Sierra Club S.D. WHAT? WE HAVE TO HITCH UP THE HORSES AGAIN? Escondido was considered to be in the far northern reaches of San Diego County in the late 1960s. 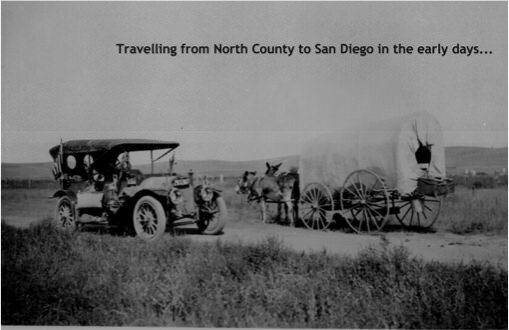 To participate in Sierra Club activities meant a long drive south to San Diego on old Highway 163 before the creation of the interstate we now know as I-15. In 1970 about 6 like-minded Sierra Club members decided to start a North County Group. With guidelines from the National Sierra Club office, the North County Group wrote by-laws and began meeting at members’ homes in Escondido. Members who began the group were Bob Dawson, Gene Barber, Jean Love, David Martin, Richard Malm, Penny Deggelman and Donna Beck. The membership for North County numbered 352 in 1971. The group was instrumental in saving the Wilderness Gardens near Pala and the Agua Tibia Wilderness area near Temecula. The first Basic Mountaineering Course (BMC), the precursor of our current Wilderness Basics Course, was held at Del Dios Junior High School in 1971 with 11 students. Dave Martin was the first chair of the course. (A year later the registration cost for the course had to be raised to $3.00 as too many people were taking advantage of the student discount!) Over the years the course’s curriculum was changed and, therefore, renamed the Wilderness Basics Course (WBC). The North County WBC continues under the auspices of the Escondido Adult School and meets at San Pasqual High School in Escondido. One of the stated goals of the North County Sierra Club in 1972 was to keep “the outdoors clean and the necessity of conservation.” John Muir would be proud of us.